This morning saw indictments handed down to Paul Manafort, the former campaign chairman of the squatting U.S. president, on—among other things—conspiracy against the nation. Manafort, alongside his aide Robert Gates, surrendering to federal authorities represents a significant escalation in Special Prosecutor Robert Mueller’s probe into the campaign’s Russian ties—as is the somewhat less grabby, but potentially even more damning news that Trump’s campaign foreign policy advisor George Papadopolous, who tried to arrange meetings with Kremlin officials to secure “dirt” on Hillary Clinton, has now admitted to lying about that to FBI. By any objective journalistic standard, this is today’s biggest story, meriting wall-to-wall discussion on most serious networks. Which is why Fox News spent the morning talking about the Clintons and cartoon cheeseburgers. Directed, as always, at its most dedicated audience of one, Fox & Friends at first devoted approximately 10 seconds to apologetically delivering the Manafort update to the floor. “The breaking news, according to the New York Times: Paul Manafort and a former business associate by the name of Rick Gates were told to surrender to federal authorities, and apparently they will sometime this morning,” co-host Steve Doocy said, making sure to caution that this is just what The New York Times is saying. All right, Alan, good to know. On to the real news then: People can’t stop talking about Google’s new cheeseburger emoji! This big, somethingburger controversy that’s threatening to consume America today, Fox News reports, all stems from Google’s placement of the cartoon cheese on this cartoon burger—which some say should always be on top of the patty, not beneath it. Of course, we know this is just a witch hunt, pure and simple: We should all be focused on the real criminals over at Samsung, who insist that the cheese goes between the lettuce and tomato, and who should be set on fire. Still, perhaps at a time when conspiracy charges are being handed down in the investigation into Russian interference in the U.S. election, it is incumbent upon the media to be reporting on what really matters today, like what Halloween candy is the best. What sick, twisted degenerates even bothered voting for Boston Baked Beans anyway, and how soon can they be deported? Our brave troops did not sacrifice their lives so you can pretend to enjoy sucking a shriveled peanut out of a quarter-inch of gloppy sucrose wax. Anyway, while all those other channels were busy looking into these clearly partisan charges based on tenuous political connections over things that happened years ago, Fox & Friends was getting right to the bottom of Hillary Clinton and Obama selling uranium to the Russians. Other breaking Fox News on this momentous morning included segments on GOP tax reform, another National Anthem protest by the Houston Texans, and a pair of recent op-eds in The Economist and Newsweek that suggested, respectively, that American soldiers aren’t all that patriotic and that all “conservative loudmouths” are Irish-American. 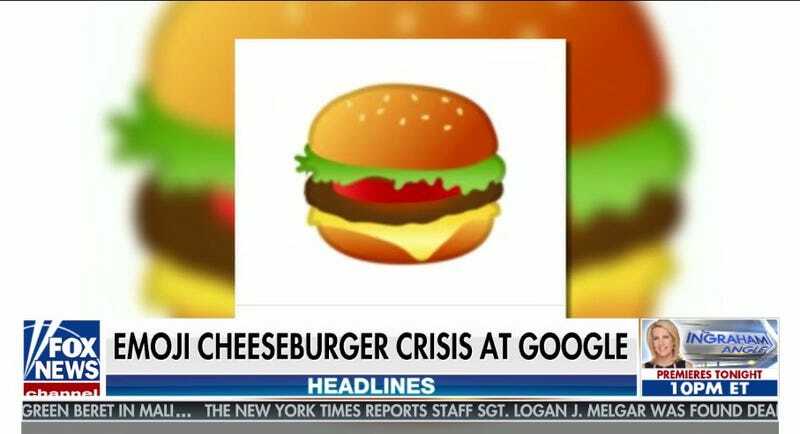 Fortunately, Google CEO Sundar Pichai has already announced the company will “drop everything” to fix its cheeseburger emoji, so Fox News can now move on to covering the story everyone really wants to talk about today: Are sad millennials ruining Halloween? And how long can they really expect to get away with it?